The popular opening parade of the Festival of the Bells will be held Thursday, July 2. Parade line-up begins at 3 p.m. at the fairgrounds. Judging will begin at 4:30 p.m. for floats. The parade will arrive uptown at 6:30 p.m. Awards will be given for Best Theme, Most Patriotic, Best Religious, and Most Humorous. Shown is a scene from the 2013 parade. 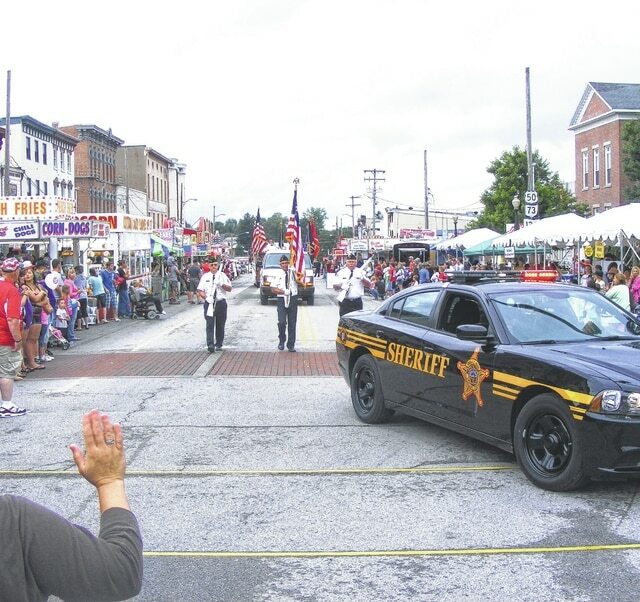 Some new events, some returning favorites and the traditional kickoff parade were announced Wednesday for the 2015 Festival of the Bells in Hillsboro. The festival will take place July 2-4 in Hillsboro. The festival will once again begin with the annual parade on Thursday, July 2. The theme for this year’s parade is “Little Town, Big Heart.” All organizations, churches, businesses, and interested individuals are invited and encouraged to participate. Parade line-up begins at 3 p.m. at the fairgrounds. Judging will begin at 4:30 p.m. for floats. The parade will arrive uptown at 6:30 p.m. Awards will be given for Best Theme, Most Patriotic, Best Religious, and Most Humorous. Festival committee members will be hosting an event which will give back to the community, organizers said. Organizers are encouraging all food pantries, churches, and other similar groups to participate in the event by entering teams in the contest. All items necessary to participate will be provided by the committee members. The event will occur on Thursday, July 2 at 5:30 p.m. Teams of two members will need to register that evening at 5 p.m. at the Information Booth. Team members must be 18 years of age or older, and will need to sign a waiver form. Food pantries may be represented by multiple teams, but participation will be limited to the first 25 teams. Entry form, waiver form, and contest rules for the event will be available on the website and at the Festival Information Booth. For additional information, contact festival committee member Bev Carroll at 937-725-5208. “Festival Finds Scavenger Hunt” is a new event added this year. Teams of two will register at the Information Booth, then race to complete a list of interesting details about the festival. Contestants must be at least 16 years of age or accompanied by an adult (minors will need a waiver form signed by parent). Teams could be comprised of parent-child, friends, etc. Prizes will be given to the first, second and third place teams. Winners will receive their choice (with the first place team choosing first) of two VIP tickets for the Saturday evening concert, two “Meet and Greet” passes for RaeLynn, or two “Meet and Greet” passes for Chase Bryant. Winners will be based upon which team correctly completes all items in the shortest time. Completed forms need to be returned to the Information Booth. Any incorrect responses may be corrected and resubmitted. Registration will begin on Saturday, July 4 at 12:30 p.m. and the contest will begin at 1 p.m. All contestants will need a digital camera or phone with camera. For additional information contact Bev Carroll, festival committee member, at 937-725-5208. The “Famous Folks Look-A-Like Contest” will allow contestants to show their likeness to famous people. Two divisions will be awarded prizes, 16 and under, and 17 and older. Contestants will be judged on their likeness to an actual person, past or present, and must be family friendly. Inappropriate costumes may be disqualified at the discretion of the judges and-or committee. Grand prize winner in the older division will receive two Reds baseball tickets for Highland County Night on July 17th. The Grand Prize winner in the younger division will receive movie passes to STAR cinemas. Other prizes include free putt-putt golf at S&K Dairy Cup and Ponderosa gift certificates. The contest will be held on July 4 at 3 p.m. on the courthouse lawn. Registration will be held at the Information Booth beginning at 2:30 p.m. For additional information, contact Bev Carroll, committee member, at 937-725-5208 or 393-5410. The opening ceremony for the 2015 Festival of the Bells will include the National Anthem sung by a choir of school aged children, grades one through six. Any child who would like to be a part of the choir is invited to attend practice on Tuesday, June 23, at 7 p.m. at the Hillsboro Church of Christ. Each child should be accompanied by a parent or responsible adult. Children should be familiar with the words to the “Star Spangled Banner” in order to participate. For more information, contact Bev Carroll, festival committee member, at 393-5410 or 937-725-5208. The Buckeye Mobile Tour is coming to the Festival of the Bells on Thursday, July 2, from 5-8 p.m. The Buckeye Mobile Tour travels throughout the state engaging fans in interactive games and inflatables, all geared toward Ohio State Buckeye fans. The games will be located on Governor Foraker Place behind the courthouse. As previously reported, musical acts this year include Good New Gathering and Sidewalk Prophets on Thursday, After Midnight and John King on Friday, and RaeLynn and Chase Bryant on Saturday. For a complete festival schedule, visit the festival’s website at www.festivalofthebells.com.